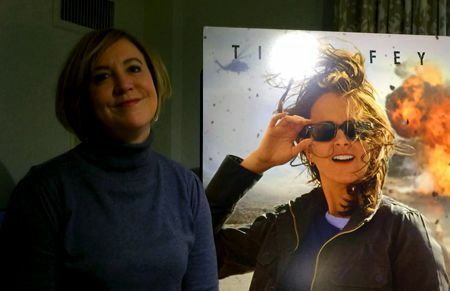 The war-reporter whose funny and moving memoir about Afghanistan and Pakistan inspired the recent film Whiskey Tango Foxtrot starring Tina Fey. With a wink, Kim Barker, author of the memoir “The Taliban Shuffle” — inspiration for the new Tina Fey film “Whiskey Tango Foxtrot” — says of the film: “I had nothing to do with it.” This signals Barker’s capacity for delivering a one-liner which states a fact while also raising a smile. As her memoir consistently exhibits, she can be dryly funny while also as seriously probing and truthful as her subject, the war in Afghanistan, warrants. Based on her five years as a war reporter in Afghanistan and Pakistan (2004-2009), her memoir is written, as she recounted in an interview in Boston on a recent visit, in a way that would draw in readers with its light touch but teach them something significant along the way. Michiko Kakutani wrote that Barker depicted herself “as a kind of Tina Fey character” in her 2011 review of the book in The New York Times. Fey got wind of the review and a couple of weeks after it appeared, according to Barker, Fey had plans well underway with Paramount Pictures and producer Lorne Michaels to do a film based upon it. After seeing funny trailers, but before actually seeing the film, Barker wondered whether screenwriter Robert Carlock and directors Glenn Ficarra and John Requa, all well known for their accomplishments with film and television humor, were going to carry that tone through the entire film. In the end she thinks “they managed a balance between the humor, the sadness and the dark parts really well,” and Barker was very happy with the result. Both the memoir itself and Fey’s adaptation are at once potently comedic and deadly serious, the story of a bold journalist making her way in a war zone. Barker says very few women were assigned to cover the war at its outset by The Chicago Tribune, where she was working at the time. Assigned to stories about “gas prices in Chicago” in the wake of 9/11, she was determined to go where the action was, and she wound up doing what she describes as the “Taliban shuffle” between Pakistan and Afghanistan. Barker covered the war with help from a devoted Afghan translator named Farouq. Early on, serious stories were in high demand. Later, she covered less personally satisfying stories like the delivery of pizza to the Illinois National Guard in Afghanistan on Super Bowl Sunday. In the film, Fey plays a character named Kim Baker, largely based on Barker. While Barker is a print journalist, Fey’s character is a photojournalist. Additionally, the film focuses dramatically on what comes between Fey’s character and a photographer named Iain, played by Martin Freeman. Though drawn somewhat from Barker’s account of her “good friend” Sean, what happens in the film diverges quite significantly from what happens in the memoir. Carlock changed the central character’s name from Barker to Baker to acknowledge some departure from the reporter’s original account. That small gesture, Barker observes, in her dry and delightfully offhand manner, “is so confusing, and made the biggest typo of my name enshrined forever.” But, as she says, she’s not complaining, thankful that the filmmakers have generally been kind to her. Barker’s centrally important professional relationship with translator Farouq is represented by one between Fey’s character and her translator, Fahim, portrayed by Christopher Abbott. Abbott “did such a good job,” Barker says, that she finds herself tearing up at certain points when watching it. In the film, Fahim is portrayed as quite serious, with a just hint of dry humor. In fact, “Afghans are cut-ups,” she says, describing how Farouq and his buddies would sit up until three or four in the morning telling jokes. Tracing Barker’s (and Baker’s) long tour of journalistic duty in Afghanistan and Pakistan, both memoir and film note the difference between a new reporter’s aggressiveness in finding the best story and the more sober reflections by the seasoned reporter on the cost of getting that edge. In addition to its slightly veiled reference in militarese to “What The F—-,” “Whiskey Tango Foxtrot” reflects the wildness of the driven younger journalist and the charged setting in which she operates. It combines wry irreverence and stark honesty in one fell swoop, as Kim Barker does so convincingly in the memoir that inspired it. – Originally appeared as War Correspondent Tells The True Story Behind ‘Whiskey Tango Foxtrot’ by Charles Munitz (aka BADMan) on the ARTery at wbur.org, March 17, 2016.